DENVER, CO – Between October 1 and November 30, more than 74,000 Coloradans have signed up or been approved for health coverage that takes effect January 1, 2014, according to data released today from Connect for Health Colorado and the Colorado Department of Health Care Policy and Financing. Through state laws, Connect for Health Colorado was established as a non-profit entity with a Colorado mission. In addition, Colorado is expanding eligibility for Medicaid. Private health insurance purchased through Connect for Health Colorado’s competitive marketplace and the expanded eligibility for Medicaid both take effect starting January 1, 2014. Enhanced federal funding that is available starting January 1, 2014 will support the Medicaid expansion. Colorado.gov/PEAK is the online application for Medicaid and the Child Health Plan Plus (CHP+). Medicaid and CHP+ do not have an open enrollment period and takes applications year round. Connect for Health Colorado has been open since October 1 and operates with separate technology and customer service operations from the federal marketplace, healthcare.gov. Connect for Health Colorado is open to individuals, families and small businesses, offering health insurance options that will take effect as early as January 1, 2014. Open enrollment for Connect for Health Colorado continues until March 31, 2014. Individuals and families can choose from up to 150 private health insurance plans from ten carriers and small employers can create small group plans from up to 92 health insurance plans provided by six carriers. New financial assistance will be available to nearly 500,000 Coloradans to reduce costs. The Customer Service Center is open from 7 am to 8 pm Mondays through Saturdays at 1-855-PLANS-4-YOU (855-752-6749). More information is available at www.ConnectforHealthCO.com. Colorado Medicaid and the Child Health Plan Plus (CHP+) are public insurance programs for low income Coloradans. The Department of Health Care Policy and Financing administers these programs. 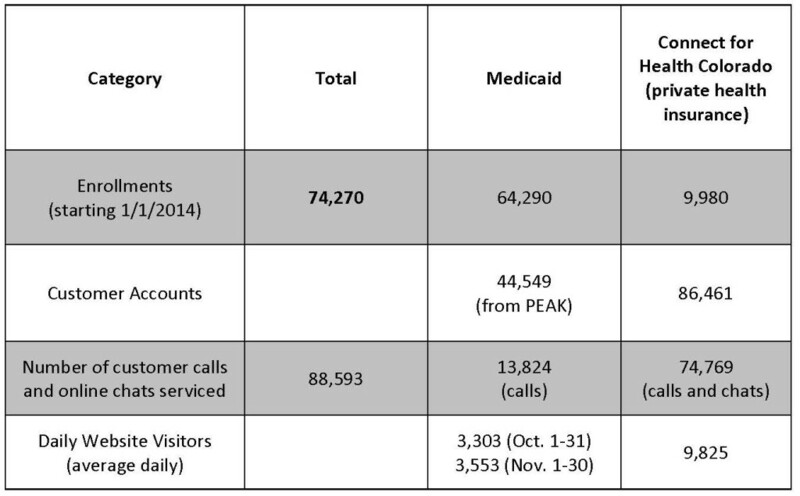 Coloradans have multiple ways to apply for coverage, Colorado.gov/PEAK is the online application for public assistance programs including medical assistance. For more information visit Colorado.gov/hcpf or visit Colorado.gov/health.